A 3x Olympian and Ironman world record holder reveals just how hard he pushes his body. A day before the Kona Ironman World Championship, Tim Don was hit by a vehicle in a tragic bike crash, breaking his C2 vertebrae...an injury known as the hangman's fracture. All of a sudden, his athletic career (which spans from being in the Olympics and winning multiple Ironman 70.3's) hung from a fragile thread due to a broken neck. His only option for continuing his athletic career was to wear a halo brace, something he compares to a "medieval torture device". 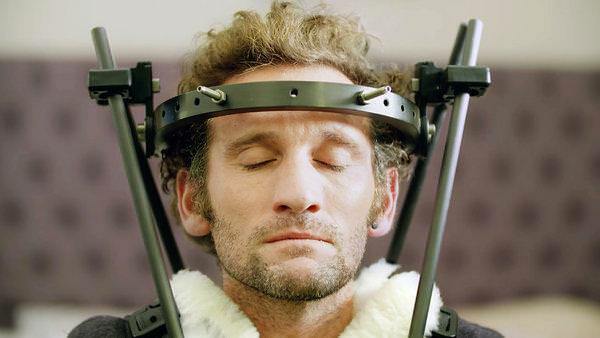 One look at it and you'd agree...5 titanium screws were forced into his skull for months, severely limiting his movement so his neck could heal. Six months later, he completed the 2018 Boston Marathon in under 2:50. After such a traumatic injury, how did Tim manage to get back on his feet so quickly? We dive into the determined, passionate, and astute mindset of one of the world's greatest athletes. The science component of endurance training...how should athletes think about the growing set of data available to them? As "amateur" sports gain in popularity with the culture shift of people wanting to become more healthy and active, how will that affect professional sports? Hey, welcome to this week's episode of the HVMN Podcast. This is your host, Geoffrey Woo. I'm really excited to be speaking with Tim Don, British triathlete, Ironman world champion, multiple-time Olympian, and 4x ITU World Cup champion. For the folks that are on video right now, and you aren't familiar with Tim's story, you look great, but seven months ago, in October of 2017, you were close to death, essentially. You had broken your neck and vertebrae, a C2 vertebrae, what is called a hangman's fracture because it looks like you had been hung, essentially. That's the same kind of damage. But before getting into that, how are you feeling? I know you just finished a sub-2:50 Boston Marathon. How are you? I'm good, thanks. It's nice to be back home in Colorado, in Boulder. The sun's out, did a great bike ride today. Yeah, 120 kilometers up super high, and I'm really looking forward to getting fit again and hopefully racing this season if I can. What a storied journey and career. I think, let's perhaps start with the accident. Talk us through it. Just to paint some context for the folks who aren't familiar with your story, but you were at sort of the peak of your career as an Ironman competitor. You had the world record in the South American Championships, so literally at the peak of your game. And then you were a couple days out from the World Championships in Kona, and a car ran you over. Can you walk us through that day, that experience, and tell us that story? Yeah, it was the Wednesday before the Hawaii race. The race was on a Saturday. By then, most, well, all the work's done. You can only do too much and overtrain, but I had some two-minute efforts on the bicycle. I woke up early, went for a nice swim in the sea, had breakfast with Frank, my manager, and some friends, and then I rolled out about 11:00. Kona's quite busy at that time of year, just because there's so many triathletes. There may be 3000 people racing, but there's probably another thousand plus of friends, vendors, and sponsors and so forth, so you kind of ride on the Queen K. I was riding in the cycle lane. Once you get past the airport, it gets a bit quieter, but before the airport, there was a petrol station, a gas station, on my right. I was riding in the cycle lane in a straight line, and then a car coming towards me thought they would turn in front of me or they didn't see me, or for one reason or another, they did that, and I remember locking up on my brakes, I remember skidding, and the next thing I remember was about 20 minutes later, waking up and obviously, I'd been T-boned by the ... It was actually a utility truck, because they were doing some roadworks, road maintenance out there. Yeah. I was reading The New York Times profile on you recently, and you thought it was just whiplash. You thought, hey, I'm a little bit beat up, but I got the World Championships in a few days. Let's rock and roll. Yeah, I mean, you know, you put everything into that race, and in that moment, I was more worried about my collarbone, because my right shoulder was very sore, and that's a kind of classic cycling injury. It's quite a fragile bone when you go down. Sure, I knew I'd hit my head, and my neck was hurting...but I've never broken my neck before, so I just thought, "Oh, it must be whiplash." But definitely, probably for the first couple of hours, an hour and a half or so after the accident, it was more my shoulder that was really hurting. They X-rayed my shoulder when I got to hospital, and they said, oh, it wasn't broken, so at that stage, I was like, well, it's a bit stiff, so maybe I can kind of just get through the swim. Maybe I might have to get them to change my position on the bikes. I'm not as aerodynamic if I've still got whiplash. But I think the procedure is when you have a head injury is they want you to do a CT scan. Thank goodness, everything was okay. My brain was intact. Well, as much as it was before the accident. And then they wanted to do an MRI of my neck, and then they called in and they wanted to do another one. At this stage, there were three nurses. One had my head, one had my hips, and one had my ankles. They'd slide me across into the MRI tunnel. Then after the second scan, all of a sudden, they say through the headphones, "Yeah, we're ready. Ready to come and get you." All of a sudden, eight nurses walked in. I thought, oh, what's going on here? I'm not that much of an attraction. Then I realized it was more serious, because they were, all of a sudden ... I'm not saying they weren't serious, but it went from, "Hey, where do you come from? I love your accent," to, "Okay, hold his ankle, his shin, his knee." Really, stability was the key, and they were like, "Don't move." I was like, "What's happened? What's wrong?" Obviously, they can't tell me. They had to wait for the doctor to confirm, and that's unfortunately when I found out that, yeah, I'd broken my C2 vertebrae. So yeah, not ideal two days before the biggest race when, as you said earlier, I was in the shape of my life. I was current world record holder. Yeah, I'd just got third at the World Champs for the half Ironman, so everything was looking good. And this was the Ironman South American Championship? No, that's this year. Last year, they were in Chattanooga in Tennessee, yeah. Yeah. I mean, you go from ... I think if I hadn't have been in such good shape and if I hadn't felt so confident within myself that I could perform to the best of my ability, it wouldn't have been so hard, but when you're so close to what could have been a career-defining moment, winning a race of that magnitude literally changes ... We're not a big sport, but it really does change your life, and it took a while to come to terms of not even being able to start. If you have a bad race or you have stomach issues or you get a puncture, at least you'd been able to start the race. So yeah, that was pretty tough. Did you ever find out who was the utility truck driver? What was the emotion like? I'm just putting myself ... I can't imagine being in your spot, but I would imagine that there'd be a lot of hatred or emotion towards the driver who was so careless. Talk us through ... What was is Tim's head? I genuinely have never felt like that. My wife at times has been very annoyed, but we've never heard anything from the driver. There was a police report, and everything's been handled by the insurance company, but he's never reached out to me at all. Yeah, you know, I was more frustrated that this situation had happened. I was in a cycle lane, there were at least 3000 cyclists within that tiny area. There aren't many roads in Hawaii, well, in Kona. So, everyone knows. There's new signs put up two weeks before the race saying, be careful, there are extra cyclists. For me, it was more frustration and disappointment than actual anger and resentment to the driver. Initially, I guess, you're just dealing with the practicality of, at first, they said, "We want to give you some pain meds," and I said, "I can't have any, because I've got a race in two days." They're kind of going, "Well ..." I said, "Well, I think it's just whiplash and my shoulder now we know is not broken, my collarbone." There's so much going on in your head, but the last thing on my mind was the driver. For me, when they really started saying, "Can you feel your toes? Are they tingling? Have you lost bladder control yet?" I'm just thinking, "Oh my gosh, why are they asking me these questions?" They kept on testing my reflexes down my legs. That's when I realized it was ever so serious, but then again, you're not really thinking about the why. You're just thinking, I'm very practical, I was just thinking, okay, what do we do? This is not my field of expertise, whatever you guys say, this is what I'm going to, we're going to do. I was lucky. My coach was there, Julie, and one of my great friends who came out to watch, and I trained with him, Pat, and Frank, who manages me. It's not like show me the money or Jerry Maguire or anything like that. We're all very close, and we all live in Boulder, so it was really great having those guys there. I think it was almost tougher on them in that moment than me, emotionally, just because I guess I'm dealing with the pain, but they're looking from the outside in and going, oh dear, he's definitely not racing. The coin was flipped on its head just like that, and literally, yeah, it was how we dealt with it, I guess. My experience with elite endurance athletes, especially endurance athletes, are that they're some of, probably, the toughest mental warriors on the planet. Would you say that your ability to eat pain over eight, nine, extended hours of pushing yourself, do you think that was a contributor to how quickly you bounced back from the injury? Literally, I think again, for the listeners who aren't familiar with your story, this was seven months ago, and you just completed a full marathon, back in the groove training, and really, back in the saddle. Where do you credit that mental resilience? Obviously, you have a support network, but I'm curious to hear that story. Yeah, as I said earlier, I'm very practical. For me, once I've flown home to Colorado and I saw the specialist and they told me I had to have the halo on, and obviously, I didn't particularly, to be honest, know what a halo was, but that was what they recommended, and you do what the doctor says. Yeah, can you describe the halo? Can you describe the halo to our listeners? Yeah, the doctor, Dr. V, he gave me three options, and he said, "First of all, you can wear a soft collar." You see those neck collars, "But you are going to have some movement of your head, so I guess the calcification of the bone." They were very worried, not so much about the bone healing, because that will heal. They were more worried about the curvature of my spine and the gaps between my vertebrae. He said, "That's not going to hold it solid." He said, "You could get them fused," where they get two titanium bolts and fuse C1 and C2. He said, "You could lose up to 50% of left and right and up and down," and I was lucky. He, himself, was a triathlete as an amateur. He'd been to Hawaii and raced there, so he knew, when I said, "Oh, I do a bit of training," he knew what "a bit of training" really meant. It was 30 hours a week. He said, "What I would recommend is a halo." He said, "It's going to give you a 90% chance of 100% recovery," and I said, "Brilliant, we'll do the halo." What is a halo? Basically, the reason they call it a halo is it's a carbon circle that just floats around your head, and then how that is attached to your body is they drill two holes into your skull here, and then two at the back. Then from the halo, you have these big carbon poles that go all the way down to this brace that goes down to your belly button, and the same on the back. It basically locks everything via attaching to your skull. It's basically a plaster cast for your neck, and literally, you cannot move unless you're moving the screws within your head. Unfortunately, they don't put you to sleep when you have a halo, so they just give you local anesthetic. Again, you don't have much flesh on your forehead, so there's not much absorption of the local. So, it's not something I'd recommend just I'm getting it put on. When you ride your mountain bike, you tighten your seat post with an Allen key. You tighten that to five newton meters, that's the torque. You can go up and down crazy bumps, and it will not move. Well, the screws in my head, they were even tighter. They were up to eight. Literally, they tightened this one, then the back, then the front. They have to do it equally so the pressure's equal on my skull. It's just a big titanium screw with a big nasty point on that they just kind of ... Yeah, they just get an Allen key and just tighten it, tighten. Yeah, like a wrench. Then for the next three weeks, the neck's not that painful, really, because the screws are so painful. Yeah, your whole life, again, it's quite a big frame. It comes out here, so I couldn't wear normal clothes. I couldn't wash and shower, had to sponge bath. I slept sat upright for three weeks in a chair because I couldn't lean back, because any pressure on the brace would affect the angle of the screws, which would not be very comfortable. Can't wash your hair, can't put clothes on. I've got a three-year-old son and a seven-year-old daughter, so I can't help my wife with bath time or school run. Yeah, I can't ... It really, I really don't recommend it. Go for the fusion. Literally, screws in your skull? I'm sure there was chances of infection with it pus-ing out. We call them medieval. The photos that are online, we can show them on the show notes. It looks like you have literally screws drilled in to lock your head in place. That's exactly what it is. Three times a day, my wife had to wash the screws with hydrogen peroxide for infection. After about three and a half weeks, I decided I wanted to do a bit of training, and then any movement made them a little bit loose, and I could feel some of them coming loose. So I had to have them re-tightened. That, they don't use any local. You just need to bite down on something. Then unfortunately, the front left one, every time they tighten it, it goes deeper into your skull, and they were worried that because they'd tightened it quite a bit, I had to get a CAT scan not on my neck, because every three weeks, I was getting scans on my neck just to make sure the curvature was good and everything was okay. But this time, I had to get a CAT scan just on the screws, because they were worried that if they tightened it again, it was going to pop through my head and start screwing into my brain. So, unfortunately, I had to have a fifth screw. They had to take that one out, and about a centimeter to the left, they had to drill a new hole into my skull. As I said, go for the fusion, guys. In retrospect, do you regret it? How's your recovery? It sounds like ... It looks like it's imperceptible. It looks like you're completely fine. My neck's still a bit like this. No, I mean, yeah, for me and what I do, if I wanted a job, that was the only option. Definitely, you put trust in doctors. Even when you've got a cold and they say you need antibiotics, you never question that. You just take antibiotics. But I was put in not just my health, but my job, my career, my security for my family, and no, for me, it definitely, dare I say, it was worth the pain for the three months. I had it on for three months and then they unscrewed it, and then I had an Aspen collar and a Philadelphia collar, so quite aggressive neck collars for another six weeks. Then, I had a soft collar, and then about three, about seven weeks ago, I had nothing on, no collar at all. But no, I think ... I kept on asking the doctor, how am I doing? I haven't got 100% function. I don't know if you can see. This is my good side. And that's my bad side. That's as far as I can turn my head looking that way. So, don't do that. Please don't do that. So you can see, and I've said, look, you've said this. And he said, "Well, I'm going to be honest, Tim. You're so far ahead of the curve, we don't know." Normally it takes a year to 18 months before people are ready to go again, but I [inaudible 00:18:26] doing something, I'm doing it. I was getting physiotherapy three times a week, I was getting soft tissue work. I lost a lot of muscle mass in my chest, so we had to build that up, but we didn't want to build it up with training it to move improperly, because I wasn't turning my head. I was turning my whole body. So, I had lots of tightness, my fascia around my muscles was locked. I had lots of scar tissue around my neck. Again, it's quite a sensitive area, your neck. If you have a sore quad, you can get the therapist to really get their elbow in and kind of iron it out, but you've got so many things going on here, and the joints, again, you can't really force them. If you get your lower back cracked, they really put pressure and whack your leg when they bring it over your body, but you can't really do that with the neck. One time in physio, I blacked out, because she's pushing so much that I just lost consciousness for a bit. So, I mean, it's not perfect. I'd say the last two weeks I've had a breakthrough with swimming, because obviously, when I swim, I need to turn my head to breathe, so I had to do all my swimming with a special swim snorkel that kind of comes up here. Now, I can do most of my swimming by only turning to the left. I can't breathe to my right. So, through the recovery process, sounds like the physiotherapist was a big part of that. Did you watch anything from a nutrition perspective? Any other protocols that you experimented with through your recovery? Yeah, I've been a professional triathlete since '97, so I've never taken more than 10 days totally off. So, to have three and a half months, and I'm no spring chicken. I wasn't sure what my body was going to be, but I was worried I was going to put 1000 pounds. I think with the pain and everything I was going through, it really suppressed my appetite. No, but I mean, obviously, when I had the halo on, I was drinking, eating, lots of bone broth. I was taking calcium, magnesium, and vitamin K. I was taking lots of products that would make your bones strong and recover and repair quickly. When I had the halo on, we decided that we can't do anything with my neck, but my body hasn't had any time off for that long, so I didn't want to start running again whenever I could and tear a calf, because my calf muscles are so weak because they've just five months. So we did lots of stability, core work, and with that, even with the halo on, I had to watch what I ate, I had to up my protein intake. Yeah, just be vigilant with that. Since then, getting into training, I did lose a lot of muscle mass in my, as I said, upper body, but also my quads. So again, I have had to do some extra gym sessions and more strength work. Hill running, over gear work on the bike, and with that, your muscles become fatigued, so again, I had to up my protein intake. I want to step back and zoom to the history of your career. I think you put it right. You're no spring chicken. You're a very accomplished athlete. ITU world champion, multiple Ironman triathlon champion, competed for Great Britain in a couple Olympic Games. How did you decide to be an elite endurance athlete? When you were young, did you realize, hey, I can run faster than all of the other kids around the block? What were those seminal moments that created you today? I think I was very lucky that I was in the right place in the era in the right time, and it's funny you should say I was the fastest. England's separated into counties, and then when you're at school, you try and represent your county. They take the four best from your county, and then you're raced together to become the English schoolboy champion. I was the fourth best in my county, but unfortunately, I was the third best at my school, because there were two great runners at my school, and we used to train in a run group on a Tuesday and a Thursday. This was when I was about 12, 13, 14. There was this other guy who just moved over from Somalia who was at another school, and he joined our run group. That's a guy called Mo Farah, who is a four-time Olympian gold medalist. He just got second in his marathon. I was just embedded in endurance sport, and I lived in West London, and there was a famous park called Bushy Park. All the Kenyan athletes back in the 90s that used to race the European circuit for distance running, they would base themselves in my town, Teddington. So straight from the off-go, I had all these amazing runners around me. Then there was a small swimming pool which was open air, which was very rare in England, because it gets quite cold, and there was a small triathlon club. There was a guy five years older than me called Spencer Smith, who in '92 and '94 was the world champion. He was in the same school as me. He was in the same triathlon club, and I remember, I was a good runner, but I realized, seeing the talent that I was training with, I couldn't go to the Olympics as a runner. I couldn't compete with these guys. I remember one day, this guy Spencer, he turned up in his convertible Mercedes. He undid the boot, got out this funky pink bike with these funky wheels, and I thought, that's what I want to do. Then I did my first triathlon and I just really enjoyed it. To mix three sports together, and now, you don't even say that. It is one sport, you know, in itself. Yeah, I represented Great Britain as a youth, as a junior, in 1998 I was a junior world champion, and that really spring boarded me to be able to support myself as a professional ever since then. Was that the key event that you realized, hey, I could be the best in the world in this? Obviously, you get a lot of data as you compete and realize the numbers. When did you decide, hey, I can make this my career? You know, I think we all dream, and I dreamed that I could do that 1996, 1997, but as a practical side, I had a part-time job. I'd finished my schooling, and I'd taken a gap year before university. My parents desperately wanted me to go to university. I realized that the only way I could not go to university and be a professional was if I was the best in the world. I had a bit of bad luck that year. I did the European championships, which are quite a big deal in Europe. The night before the race, someone decided to steal my bicycle, so I ended up racing the next day on a borrowed bicycle, which wasn't the right size. It wasn't ... And I got second. My dad picked me up from the airport, and he's like, "Oh, great race, but you know, when are you going to finish university?" and I said, "Well, look, if I don't win the world champs, I won't go to university. If I do win them, we'll throw the sand in the wind and see what happens." I thought, God, what did I just said? Then, that was in early season. Then I had some good races. I would always race as a professional in the senior ranks, but then for the world champs, I'd come down and race as a junior. Yeah, the junior world champs were in Switzerland in a place called Lausanne, and yeah, I won the race, and at the same event in 1998, they also announced that it's going to be an Olympic sport at the Sydney Olympics in 2000. I think the combination of being a world champion, it gave me that boost for sponsorship, and the fact that it was going to be an Olympic sport, like you do with cycling, rowing in America and England and most of the major countries. All of the sudden, we were ineligible, so there was training camps. There was more science involved, more from looking at our diet from where we trained, why we trained, altitude and so forth. Again, if I'd had won two years earlier, I wouldn't have had that support, but I had two years to go, and I mentioned to qualify for the Sydney Olympics, where I finished tenth. Myself and a Spanish guy, we were the two youngest guys in the triathlon competing. Very cool. You bring up an interesting point that I want to touch upon, the science component. Some athletes are more animals, just running on instinct. Other athletes are very, very quantitative, very, very scientific. They track everything, HRV, their macronutrients, their different blood metrics. What's your thought on that personally, and then how has that changed in the sport? 2000 is 18 years ago. I know that Ironman has exploded in popularity and triathlons have exploded in popularity since then, so I'm curious to touch about those two aspects. What kind of technical versus instinctual athlete are you, and how has that sport evolved? How has it evolved? Massively. As you said it's gone from the dark ages to the future, to the Jetsons. I would describe myself as very balanced and right down the middle. When the gong goes, you need to make those smart decisions, but to get to that position, you need to train smart. If you've got a Ferrari, you're not going to put the cheap oil in it. You're going to do your research. In 1998, I trained altitude. I was already training with power, which that was unheard of back then. That was all through my coaches. I'd always surrounded myself with what I guess I would call a cell of core people that I could bounce ideas off. They could take the lead and do things. I'd get blood work done three times a year, quite in-depth reporting. I've got a blood passport, so we can track it over the years. We use all the metrics from heart rate to your total stress scores to your critical load factor. Again, with my diet, I've used a nutritionalist, various nutritionalists over a long time. The flip side of that is I don't like to be ruled by them. Numbers and data are a tool, but there's still an art to coaching. In terms of, you mentioned a power meter. I guess in '98, probably there weren't that many power meters. This is for the amount of wattage you're producing on a bike. I'm curious. Now you see amateurs, essentially, with all sorts of gizmos and gadgets. Is that changing the sport, or is it still a little bit ... I'm curious to get your thoughts on all the peripheral paraphernalia of triathlons. There's quite a bit of a cottage industry out there now. There is, absolutely. I think the good coaches use the data, but they're not ruled by it, and I think the amateurs, people are having now, when you've got your bonus, say you worked in the city and you got your Christmas bonus like 18 years ago, you might go out and buy a $1000 bottle of wine and a new Porsche. But now people are going on a sporting holiday in the Canary Islands or to some specific sports hotels. They might buy a new race wheel or get some bloodwork done. I think the whole people's outlook on life is more health, and I think that, therefore, the athlete of those 1%-ers who are the dedicated trainer, they are definitely looking to invest in themselves. They're like, I want to beat my friend, or I want to go faster. It's not a case of being tough and just fighting through. Sometimes, to go fast, you have to go slow. I definitely think that side of thing has really evolved. Before, it was just a tough trainers who got first, but now I think it's definitely the smartest trainers. Any specific tool or device or metric that you think is worth highlighting in this conversation? I guess in terms of our conversations with different military operators and athletes, HRV and heart rate variability as a sign for recovery seems to be relatively popular. I'm curious, anything in your experience, sort of stands out as things to look at? I think first of all you need to record ... You and a period of time. You can't just do it for a week. You need everything. You need it for four or five months, then you get a ... For me, we've got seasons of data, so we can really see the flow and trend of how my body reacts to certain stimuli, whether it's speed work or endurance. But no, I think definitely on the cycling, it's definitely the power meters. It's not the data, but it's how we interpret that data, and I know there are a few companies that made power meters for running, but we don't have the software to interpret that. The understanding, it's just raw data. Definitely, I use my heart rate for all my cycling and all my running, and we always take my resting heart rate if I'm under the weather. Again, swimming pool is so simple, because it is 25 meters long, everything is quantifiable, we can see the speed, the pace, I can count my stroke. We like to use everything, but definitely, heart rate and power, if used correctly as tools, not as religious, because there are some days when it's the last rep of the group, 20 times, or five times, 10 minutes, and you feel good on the last one, then for me with my experience, it is worth pushing it. If I don't feel so good, maybe I back off the last one. I think that's when you can't become a slave to data, and it's that balance and having a coach or having to mind yourself ... As I say it's easy to train hard. It's simple. You just flog yourself every day, but it's so much harder to train easy. I mean, break yourself, right? You'll break yourself. I think it's interesting. I think a lot of our community members, our listeners, are probably what they would describe as bio-hackers. They are all about quantifying their own biometric data. When they're training, not surpassing the lactic acid threshold. Not burning themselves out too quickly. So, I think a big aspect upon this is what you mentioned a little earlier, which is nutrition. Curious to hear your thoughts on the different macro-ratios that people are talking about. The ketogenic diet has been talked about a lot in the endurance communities for not having to be glucose-dependent, not hitting there wall, especially for an Ironman, which is seven, eight, nine, plus hours in competition. There's this notion that nutrition is the fourth sport of triathletes. I'm curious to hear your experience on, have you played with the ketogenic diet? Is it something that is interesting? What's the latest in nutrition strategy for you? For me, it's keep things simple. Through small trials and errors, we find things that work. I'm a believer of a balanced diet. I'm not going to ... Some of my friends, they have a bullet coffee and they go and ride for six hours on water while I just did a four-hour ride. I had two bottles of carbohydrate drink and I had some energy gels as well, and as soon as I came home, I had my shake and then I had a sandwich. As I say, especially with children, you just get a bit crazy, balancing it all. I think there's no set diet that is going to make everyone a better athlete. It's the same with how there's no one running shoe that's going to make you faster. You're trying to win, yeah. Absolutely. To a degree, that's why I've got my coaches. They do the research more in detail than me. I can't look at every aspect of my performance, which helmet to wear because one's faster than the other. They say these are the two fastest, which one's comfortable? They would say, this is a ... When I talk to Kaiser, my nutritionist, she goes, at the moment, I really want you to ... You should be having lots of more natural fats, lots of nuts, avocado, fish oils. I'm not going to say, "What about this?" I totally trust these people who are in my cell, in my network. But yeah, no, diet's an interesting one, I think, because it is the fourth discipline. I don't know ... I would say it's not as big a discipline as the other three. Do you know what I mean? You can't eat your way to victory, right? Definitely not. I think yeah, but then psychologically, if you do something and it works, like I'm sure there are some players, they don't shave their beards and things like that, I'm sure there are some that at halftime always have a twin key or something like that, and you're like, well, that's not really nutrition-y. Soccer in England, my father was heavily involved in football in the Premier League, the top flight. At halftime, they'd have a cup of tea and an orange. Now, they have an energy drink. They have shakeouts of their legs. Before a marathon, everyone would have a steak. Now, no one's having a steak. I think it's changed so much. It really has. I think the data is getting stronger, and I think you're actually toughing a good point that I think a lot of people in the keto community don't realize. Carbs are really efficient fuels. If you are trying to burn through and pass through the lactic acid threshold, you need carbs, and I think there's different variants for different styles of training and different styles of competition. I agree with you that there's no one size fits all. It's just, how do you personalize your training protocols, your diet, your actual style, and what your genetic makeup is, and build something tailored to your personal performance? One point that I wanted to tease about was that you started off at the Olympic distance, which is quite a bit shorter than the half Ironman and the full Ironman. Curious to hear your trajectory as you started gravitating towards longer and longer endurance races. I think, unfortunately, age catches up with you, and it's a bit like track and field. You get the top guys running the mile, then 3000 meters, then 5000, then 10000, and as they get a bit older, you lose that speed. Then you go to the road, half marathon, marathon, and it's similar to triathlon. Up until 2012, I raced the short course, which for us was an hour 45. It involves a lot of traveling. I would literally probably spend seven or eight months a year on the road, from training camps to the first race is in New Zealand, the second one's in America, then you're back to Japan, and then you're to Europe. With a young family, and I always wanted to have a go at Kona I really did, and I wasn't getting any younger. I thought, I could do ... And in the short course, everything's a four-year cycle, because you're trying to qualify for the next Olympics, trying to qualify for the next. At 2012, I thought, there's a good chance I won't make Rio. Now, I'm young enough, driven enough, because again, that's just as important as your physical wellbeing. I only had a young family at the time. Let's move to America and work with 70.3s and then from there, try a few Ironmen. That's how I progressed through the stages. Now, I can see the younger athletes. There's a couple of them, the current Olympic champion and silver medalist. They've started to do some half Ironmen, because they're not getting any younger. You can see the natural migration of what your body will allow you to do to stay at that top flight. What is your sense? Is it the sense that endurance doesn't fade as quick, or do you think that given just the amount of miles you've put, that your endurance actually improves as you just spent more and more miles on the road? What is your sense on that? I don't know. I think what it came down to is when I was 23, I didn't have to stretch before a hard run. I'd just put my shoes on and go. Now, you've got to look after. My body's been through a few miles. You do lose that speed, and it's the intensity of the training. My body, I could do the same intensity as I was getting older, but I'd need more recovery. I couldn't do them twice a week. It was only once every 10 days. You need to do these key, very intense sessions, because we are running and riding and swimming very fast. With endurance, once I changed the training, it was more about how long can you go as close to your threshold as possible. You've got all that speed in your legs, so you can tick that box. Now, it's just make yourself as efficient as possible, so if you need to, you can still access that speed, but not every two minutes, which is what you used to do. I think for me, it was a case of I realized my body couldn't take the pounding of that very intense level four, level five day-in, day-out, while I can today, I went for a four-hour bike ride at 9000 feet, and I know if I recover well, I did a run off the bike as well. Tomorrow, I've got a hard run, but again, it's a hard run for the distance I'm competing at, which is a half marathon and a marathon, and not 10000 meters. I think naturally my body told me, if you keep doing this, you're going to break down, and the worst thing for an athlete is being injured. It really is. Absolutely. I think that's something that a lot of folks in our company here that a couple amateur Ironman, half Ironman triathletes here, and injury prevention. You're out for three months, two months, and you really reduced ... Your progression just stops completely. Was Boston the first event that you came back on? The Boston Marathon? Yeah. I love putting on a race number. I just love it. I love racing. I realized I couldn't do a triathlon, maybe July if things go well. The opportunity came up to run Boston. I obviously, I can't do a cycle race, because it doesn't have that same allure. You watch the professionals, but there's nothing for amateurs. The same with swimming. Yeah, the opportunity came up, and I thought, well, I definitely won't run a PD or a best time. In fact, I've never run a standalone marathon, but for me, it was just the fact that I could put a number on and compete against myself. It worked out quite well, because it was six months and four days after I broke my neck. It was very much for me drawing a line of my recovery process, and think "Well, if all these guys are winning races, when the gun goes and I'm on the start line, then no one is going to care about my story." So it was, really, for me a way of changing my mindset. I'm still obviously doing lots of rehab for my neck and physio, but for now, for me, I still have to train now 25 to 30 hours a week. Yeah, it's like a good transition phase for me. I would have liked nicer weather, because it was minus 1 degree Centigrade. I was going to ask, how was Boston? It was like the worst weather on record. Oh, first time I've been there, an amazing city. I've got so much respect for everyone that came and watched race. It's a point to point race, so it can be quite good if you have a tailwind, but we had a headwind with driving rain and the evening before, it was snowing, so it was ice cold rain. Yeah, I mean, it was just brutal. After I finished, my shoes looked brand new because there was so much standing water, it's as if I'd just had a bath with all my clothes on. I think I should have probably worn my wetsuit for the race. That was brutal. Yeah, I'm sure that was a good feeling to get a first race and lock that in. What's on the agenda for the rest of 2018? It sounds like you're going to be trying to get back to peak ... As close to peak position as possible, hopefully surpass ... Get back on it. What's in the works? That's the goal. Now, I've got a big block of six weeks of head down training. I'm going to go back to Brazil. I'm going to go back to Brazil at the end of May, which is where I broke the world record, just to watch the race with one of my sponsors, so that will be quite nice. Just to see everyone else going through the pain, and hopefully at the end of June, I can do a half Ironman in either Costa Rice or a place called Coeur d'Alene in Washington state, I think. The plan is July the 28th to either do Hamburg Ironman or Zurich Ironman, because to go to Kona again, you need to qualify, and it's a point system, so I need to basically do those races to have enough points. I would love to go to Kona, but I don't want to go to make the numbers up. I only want to go if I can fight for a top 10, top five podium spot. My coaches believe in me and my wife does, I'm very lucky, so nothing ventured, nothing gained. That's the plan for this year. And don't get hit by a car. I think it's an inspiring story, you're the man to beat. Most people can't do an Ironman in perfect health. I think just coming back and going through that trial and tribulation and stronger than ever with your mind switched on is just super inspiring. How can our listeners follow your story? How can they find you? Twitter, social? What are some things that you want to shout out here? Yeah, best chance of following me is through Instagram and Twitter. It's trithedon, and then also Facebook, TimDonFastCoaching. Then also, actually, we've just finished making a documentary for my last six and a half months, and the trailer's out online. I think the link's in my Instagram bio, but you can go to YouTube, and it's called The Man With the Halo. On the 28th of May, which was when I broke the world record, it's going to be released as a short documentary over, I guess, from here to zero and on the wake up again. Yeah, that was quite ... Yeah, I've seen it once, an unedited version, and I'm hoping people will enjoy it, and they can take something out of it, never give up. We'll definitely check it out. Thanks so much, Tim. Cheers. You train, you work hard, you put in the hours-you should be seeing results. We're constantly sending resources to those who want to get the most out of their training and race days. Subscribe to learn more.